Tis the Season!... Ready for Another Taxpayer Bailout? 1.) Pay for the "consolidation" of toll road agencies (the San Joaquin Hills Transportation Corridor Agency which operates State Route 73 and the Foothill/Eastern Transportation Corridor Agency which operates Routes 241, 261 and 133). The two underperforming agencies would use the loan to "consolidate" their $4.6 billion in existing debt. 2.) The $1.1 billion loan, if approved, would be the largest in the TIFIA program's 10-year history, would consume roughly half of the annual loan capacity for the program and would divert funding from other projects here in California and throughout the nation that are a high priority for producing new transportation infrastructure and jobs. 3.) The TCS has mislead the public regarding its toll roads by claiming that they would support themselves financially, and that taxpayers would never be asked to assume the risk of their failure. Now it is clear that the toll roads are falling far short of projected usage and revenues. TCS has responded by seeking a massive federal bailout that would put more than a billion dollars of taxpayer money at risk. 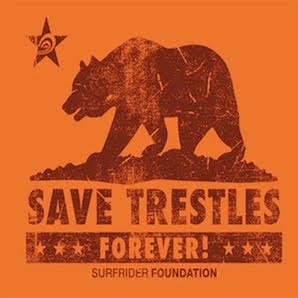 Surfrider and our Coalition partners are not the only people concerned about this massive bailout. Important decision makers are weighing in as well. Senator Barbra Boxer recently wrote a letter to the Department of Transportation saying: "It is my understanding that the funding provided by this loan would be used to stabilize the finances of the TCS's existing toll roads, a purpose that was not originally intended by the TIFIA loan program". Now It's Your Turn to Weigh in! We Need You to Write Letters to the Editor and Post Blog Comments. ****Why is the public being asked to help an agency who said they would never use taxpayer funds? ****Why is this loan being requested? If TCS is unable to manage its current finances, why are some politicians supporting TCS's plan to spend more than $1.6 billion on the proposed Foothill-South – a toll road to nowhere? ****Congress needs to ask – What have we learned from the current financial crisis about putting taxpayers at risk? In this time of scarce transportation funds and pressing economic priorities, why would the Federal Government even consider a massive bailout for a project that has already been built? In addition to writing a letter, please post blog comments (using the article links below). • North County Times: letters@nctimes.com.